By Roy Ediss, Philips Semiconductors, UK. Commercial and handcrafted probes similar to those shown in Figure 1 are commonly used in EMC diagnostic work, but have you ever considered how they operate? 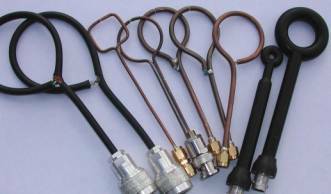 The magnetic field probes are made in the form of a loop with an inherent electrostatic shield, generally from 50 Ohm semi-rigid coaxial cable. They vary slightly in configuration and in characteristics, but essentially they are electrically small shielded loop antennas derived from the antennas used since the 1920’s for radio communication and direction finding [1,2]. Figure 1. Various shielded loops. Refer to the diagrams of the various H-field loop probes shown in Figure 2. The following explanation can be applied in general to all the probes, but the common probe type 2(a) will be considered. The equivalent circuit diagram is shown as Figure 3, which has numbered location points corresponding to Figure 2(a) [3,4]. An elegant arrangement exists where electric fields may impinge on the outer sheath but are shielded from the inner signal line. A small gap in the outer sheath is however always included, preventing a shorted-turn to magnetic fields. A magnetic field passing through the probe loop generates a voltage according to Faradays law, which states that the induced voltage is proportional to the rate of change of magnetic flux through a circuit loop. 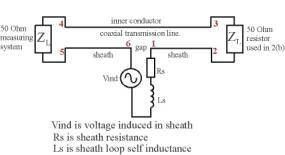 At very low frequencies a voltage would be induced directly in the internal loop conductor, but the copper sheath is quite a good shield to magnetic fields at frequencies exceeding the low KHz range. 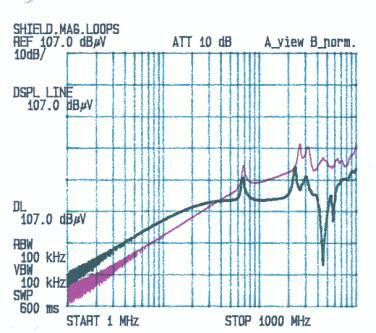 So at high frequency, a voltage is then induced preferentially in the outer sheath loop, and this appears across the sheath gap (points 1 & 6) . The metal sheath thickness is several skin depths, so this prevents direct interaction between currents on the external surface and internal surfaces of the shield. The 50 Ohm transmission line, formed by the inner surface of the sheath and the inner conductor, is then driven by this voltage and is terminated by the 50 Ohm measurement system (points 4 & 5). 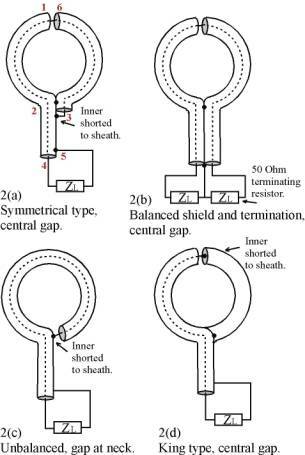 An analogy to the effect described above may be made, by considering a circuit loop arrangement where a coaxial shield termination is unconnected at one end (see Figure 4). Or an imperfect coaxial shield termination, where some ground current may create a voltage across an inductive path such as a “Pigtail” ground connection. Figure 3. Equivalent circuit diagram for type 2(a) & 2(b). Figure 4. Circuit analogy of probe construction. Probe type (2a) is common and a commercial version is available . A 50 Ohm chip resistor termination is sometimes included (at points 2 & 3 as in 2(b)), to terminate the short length or half loop of coaxial transmission line in a balanced way and help prevent contributing effects from any unbalanced cable currents. This chip resistor will however somewhat reduce the low frequency sensitivity when the probe is used as a pick-up. When the outer sheath is formed in two halves as in Figure 2(b), the outer surface of the shield may then be considered as a balanced two-conductor transmission line arrangement . This arrangement of the electrostatic shield was particularly important for direction finding as it helped avoid distortion of the loop antenna directional pattern. A Moebius version of the balanced probe type 2(b) with both signal lines connected to their opposite sheath at the central gap, is claimed to have twice the output of the King probe type 2(d) and is noted in . The King type probe is named-after R. W. P. King who discusses loop antennas and probes in [9 & 10]. An interesting 3-layer Printed Circuit Board version of the King probe type 2(d), is described in . The probe types shown in Figure 2 are not normally utilized to determine circuit current by application of a transfer impedance; they are generally used as a diagnostic aid to detect the source of signals, or as local field-generating source. Performance of the probe types has therefore been compared in a representative way, by using the microstrip line technique as detailed in  but with the probe at a fixed distance of 10mm from the microstrip line, as shown in Figure 5. Figure 5. Probe sensitivity test arrangement. Pd = 0dBm. The transfer function of this arrangement with various probe types may be compared in Figures 6 to 10. 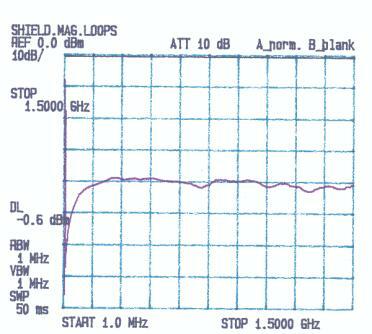 A through-connection was normalized to the reference level at the top of the plot prior to measurement. All the handcrafted probes were formed with 3.6mm OD semi-rigid coax. 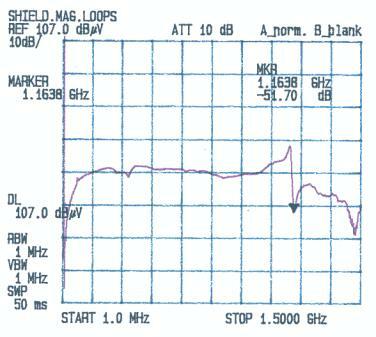 Note their uniform flat response above 150MHz due to the low pass filter effect described below. Due to the nature of the magnetic field within it, a coaxial cable transmission line can be considered to form a 1:1 transformer with its shield and inner conductor. Therefore a linear improvement in the probe open circuit voltage and low frequency sensitivity is created with more inner signal line turns. But since the probe inductance forms a low pass LR filter with the 50 Ohm measuring instrument impedance, the loop current and the high frequency behaviour is thereby notably limited by wLs above a corner frequency to a flat response. See Figure 11, which shows the effect of two inner conductor turns on performance. The probes are normally recognised to have a self-resonant frequency due to the loop inductance and parasitic capacitance between the centre conductor and outer sheath. The smaller the probe loop diameter, the higher this self-resonant frequency, but coax diameter and construction type also have an effect. 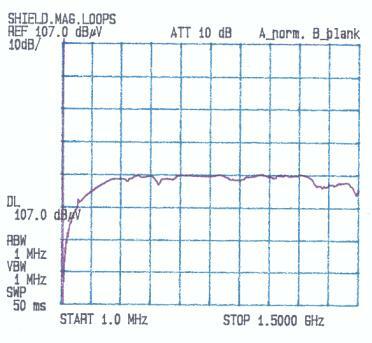 For a 30mm diameter type 2(a) the resonance occurs at around 880MHz (as seen in Figure 7). With type 2(b), 2(c) and 2(d), no resonance was seen up to a frequency of 1500MHz (see Figures 8, 9 and 10); but type 2(c) had noted sensitivity due to capacitive influence when handling probe neck and cable. From those assessed, types 2(b) and 2(d) are therefore considered to be the preferred versions of magnetic loop probe for high frequency circuit investigative use. (Unknown semi-rigid coax OD). Central gap. 3.6mm OD semi-rigid coax. Central gap. with 3.6mm OD semi-rigid coax. Gap at neck. with 3.6mm OD semi-rigid coax. Central gap, King type. One inner conductor turn in magenta. Two inner conductor turns in green. R. H. Barfield. “Some experiments on the screening of radio receiving apparatus. Screened Loops”, Jour. IEE, Vol. 62, p. 249, 1924. F. Terman. “Radio Engineers Handbook”, Section 12.2. The Loop Direction Finder, pp. 875-877, McGraw-Hill 1943. C. F. M. Carobbi, L. M. Millanta, L. Chiosi, “The high-frequency behavior of the shield in the magnetic-field probes” Proc. of IEEE Int. Symp. on EMC, Aug. 21-25th 2000, Washington, USA., pp. 35-40. EMCO, The Electro-Mechanics Company. Near field probe set user’s manual 1988. L.L. Libby, “Special aspects of balanced shielded loops”, Proc. of the IRE & waves and electrons, Vol. 34, Sept. 1946, pp. 641-646. 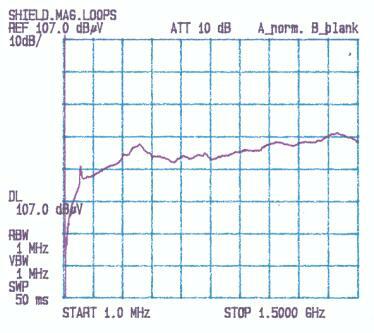 B. Yordanov, K. Doughty, R. Yordanov, “Near-field probes for EMC applications” EMC Test & Design, May 1994, pp. 18-26. [9} R. W. P. King, “The loop antenna for transmission and reception”, R. E. Collin, F.J. Zucker, Antenna Theory, Part 1, Chapter 11, McGraw-Hill, NY, 1969. [10} H. Whiteside, R. W. P. King, “ The loop antenna as a probe”, IEEE Trans. On Antennas and Propagation, Vol. AP12, May 1964, pp. 291-297. 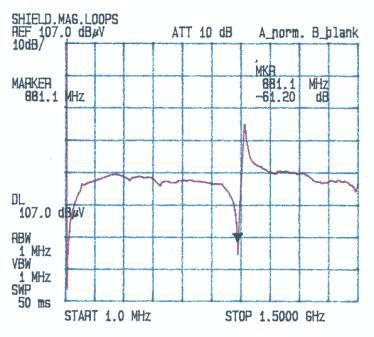 IEC 61967-6 Integrated circuits – Measurement of electromagnetic emissions, 150KHz to 1GHz – Part 6: Measurement of conducted emissions – Magnetic probe method. The theory of the shielded loop antenna is given by R. E. Burgess, “The Screen Loop Aerial”, Wireless Eng. Vol. 16, p. 492, October 1939.